Lester Eugene “Gene” Jackson, the son of Lester L. and Myrtle (Tietjen) Jackson, was born October 24, 1939 south of Riverton, Nebraska in Franklin county. 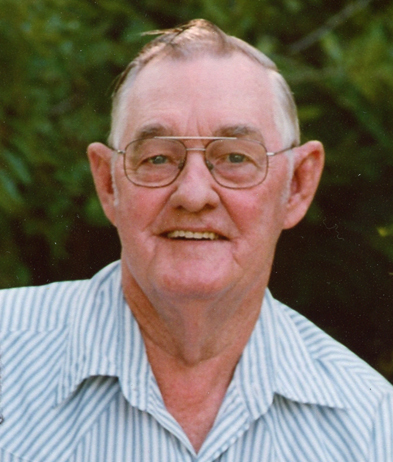 He departed this life unexpectedly on Monday April 15, 2019 at the Franklin County Memorial Hospital in Franklin, Nebraska at the age of 79 years, 5 months and 21 days. Gene received his formal education attending rural Franklin county school, the Franklin public schools and then the Riverton High School. A veteran of the United States Army and the Korean Conflict, Gene enlisted to serve his country on February 15, 1962 and was discharged on February 12, 1965. Gene was united in marriage with Beverly Dye on June 20, 1965 at Copeland, Kansas. They made their home in both Nebraska and Kansas while Gene pursued his life’s work as a heavy equipment operator. He was proudly employed with SAM and Siel Construction in Franklin for over fifty years until his retirement in 2017. In April of 2016, Gene and Bev moved from Riverton to Franklin to make their home. Gene was a member of the Riverton American Legion Post #328 for over 50 Years and had served on both the Riverton town board and as a volunteer fireman. In his leisure time he enjoyed fishing and playing the slot machines (and some times even winning). He was an avid Couch Coach of all Nebraska Husker sports. Most important to him was spending time with his family and friends. 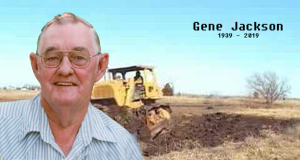 Gene’s deep and immeasurable passion in life was his love of operating the bulldozer and moving the earth to modernize the land. Local farmers say that he was an artist and master at his work. Preceding him in death were his parents and a sister, Joyce Lucht. Surviving are his loving wife of 53 years, Beverly Jackson of Franklin, Nebraska; his children, son Erold Jackson and wife Chris of Kearney, daughter Angie Grube and husband Bill of Franklin and daughter Sheila Atkins and husband Jeff of Aurora Illinois. Grandkids Ian Jackson, Oriana Lindsey, Tyler Marks and wife Tonya, Collin Marks and fiance Paige Kearney, Owen Grube, Anna Jane Grube, Jordan Atkins and Kellen Atkins. One Great Grandson Tate Marks. Brother Mike (Candy) Jackson and George (Caroline) Jackson, Sisters Marge (Les) Rose and Carolyn Jackson. Family requests in lieu of flowers memorials maybe be made to either the Riverton Legion Post #328 or Riverton Volunteer Fire Department. Memorial services will be held Saturday, 10:30 a.m., April 20, 2019 at the Crossgate Community Church in Franklin with Pastor Kasey Loschen and Pastor Audrey Beaty officiating. Interment with military honors will be at the Riverton Cemetery. Book signing will be at the Williams Funeral Home in Red Cloud Thursday and Friday, 8:00 a.m. - 5:00 p.m. There's still time to send flowers to the Memorial Service at the Crossgate Community Church at 10:30 AM on April 20, 2019.